I know a friend who has splurged more than Dhs.6,000/- on a Nikon Digital SLR and accessories. He has already upgraded his camera once and still intends to get more powerful Nikon versions. He calls his obsession - NAS - Nikon Acquisition Syndrome, a term coined by Nikon enthusiasts. Well, this weekly Emirates Today competition could be a way to get a return on his investment. A tip: One doesnt have to spend a fortune..for as little as Dhs.250/- to Dhs.500/- one can get 6 megapixels and above digital cameras of the Touchmate, Yashica variety and they serve the purpose beautifully too! My friend has found the daylight picture quality of my Dhs.250/- Touchmate 6MP digital camera to be the same as his Dhs.6,000 Nikon. 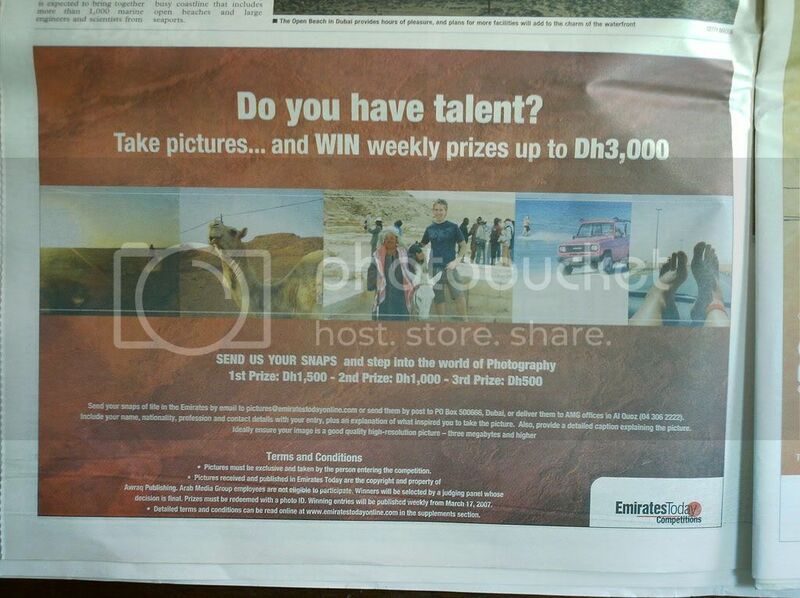 So go ahead, if you have the interest and inclination for photography...you dont have to let it hurt your pockets!